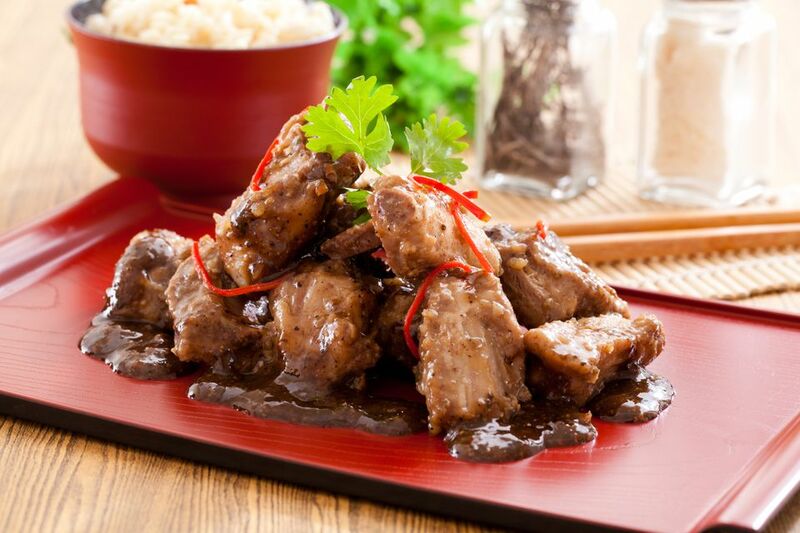 Chinese spareribs with black bean sauce are a tasty and simple dish to make at home. It works great as a main or side dish. This is a great recipe for cooks who like the one pan method of cooking. The whole mean can be completed with the use of one wok or frying pan. Traditionally, this dish is made with fermented whole black beans, while they can be found in any Chinese grocery store a simple prepared black bean sauce makes this dish much easier to cook. The prepared black bean sauce takes the work out of rinsing and mashing fermented black beans without sacrificing the flavor. The sauce is an essential time saver for any busy cook who wants a fast meal but doesn't want to miss out on great flavors. Trim the ribs and cut into 1-inch pieces. Mince the ginger. In a small bowl, combine the sauce ingredients and set aside. Heat wok to medium-high heat and add oil. When oil is ready, add the ginger and stir-fry until aromatic (about 15 seconds). Add the spareribs, stir-frying until they are lightly browned. Add the sauce. Reduce the heat to medium, cover and simmer for about 10 minutes. Optional: If you want to thicken this recipe, mix the cornstarch and water together while the other ingredients cook. Once the ingredients are finished simmering, give the cornstarch/water mixture a quick re-stir and add, stirring to thicken. - Made with ​fermented black beans.